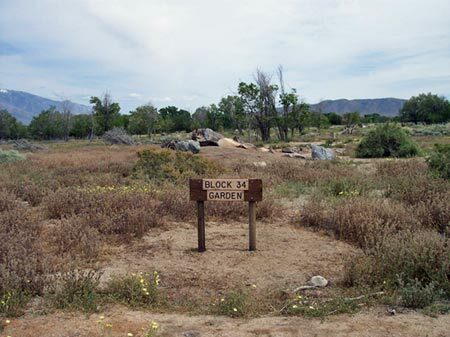 Besides the vegetable gardens and orchards, there were six elaborate parks at Manzanar. The hospital garden included "a large concrete-lined pond, a stream, dispersed boulders for seating, two winding concrete walkways, boulder stepping stones, wood-reinforced pathway steps, rock borders, and other landscape features." Pleasure Park, between Blocks 23 and 33, contained over 100 species of flowers and included a rose garden, two small lakes, a waterfall, a bridge, a Japanese teahouse, a Dutch oven, and pine trees. Cherry Park, south of the Children's Village, contained a thousand cherry and wisteria trees. Another garden included a stream, rock alignments, and a buried pond. By the mess hall, there was a large concrete-lined pond, a stream with waterfalls, an island, a sidewalk, and rock alignments as well as a bridge. The water came from the Department of Water and Power, diverted from the aqueduct. The buildings were constructed by employees of the Department of Water and Power, who worked alongside the Pauites. A. A. Brierly remembered that "the original plan was to take in the whole Owens Valley" as an internment camp. But H. A. Van Norman, the aqueduct chief, resisted, claiming, "If they put that land all back into cultivation, what is Los Angeles going to do for water?" Instead, 10,000 people were confined to one square mile, just as the Paiutes had been earlier confined to compact sections of Owens Valley in order to preserve the water of Los Angeles. The site of bountiful gardens and lush foliage appears to have had a significant impact on the residents of Owens Valley, who felt little control over whether the internment camp would be placed in Owens Valley. "There was a special sort of hostility in the Owens Valley that you didn't find in most of the other areas," Arthur Hansen commented. This hostility, which was in part simple racism, appears to have been exacerbated by hostility toward the Department of Water and Power. Much of the criticism of Manzanar appears envious. Statements such as, "They lived like kings" or "They had huge gardens" were common among those interviewed about their memories of Manzanar. Ethelyne Joseph said, "They had a lot of freedom in their little realm of Manzanar. They had their basketball courts and their tennis courts and their swimming pools, so they really didn't live as though they were in an internment camp … . They didn't have it so bad." Mary Gillespie said, "They were royally treated … . The Japanese has the best of everything … . There were all those beautiful trees down there." Jack Hopkins concurred: "It was paradise out there. Really." Those who worked at Manzanar, such as the guards, were known to pilfer from the camp. "It was just like any government project," Anna Kelley explained. "The Caucasians that worked there would come home with stuff." This kind of ressentiment among the people of Owens Valley could be said to have been transferred from the Department of Water and Power to the Japanese. Owens Vally residents seemed to envy the Japanese for having stolen their water to "live like kings." But beneath this standard racist rhetoric is the discourse of envy. It was believed that the success of the Japanese Americans as farmers had displaced what should have been the success of the white farmers in Owens Valley. Mary Gillespie said, "They had all kinds of food and you know the Japs don't really live like that, they're used to fish and rice and their own food." To the residents of Owens Valley, the revitalization of Manzanar signified only their own betrayal. The Japanese Americans of Manzanar realized what the locals had never been allowed to secure for themselves: a blooming desert. The hostility of the locals toward the Japanese was, in this sense, compounded. Manzanar came to represent, albeit in a microcosmic form, the lost history of Owens Valley. Residents of Owens Valley who felt victimized by Los Angeles often looked back to the days before diversion as almost an Edenic time. One Owens Valley resident remarked on the changes: "People who come to the Owens Valley don't have any idea what's happened to it. They come here and say, 'Gee, this is a beautiful high desert valley.' But they weren't here when the trees were up and down the valley, and river was running and the brush was green." Owens Valley residents watched the changes that occurred in their valley and felt helpless in the face of these changes. So to see this history resurrected for nonwhites stirred up both envy and racism in many people. But the rose-colored glasses of old timers in Owens Valley led to bitter resentment against the Japanese. In 1943, Ansel Adams reinforced, through his photographs, the image of the "bountiful harvest" at Manzanar. Adams took portrait after portrait of smiling Japanese internees holding giant cabbages or standing in warehouses full of squash. 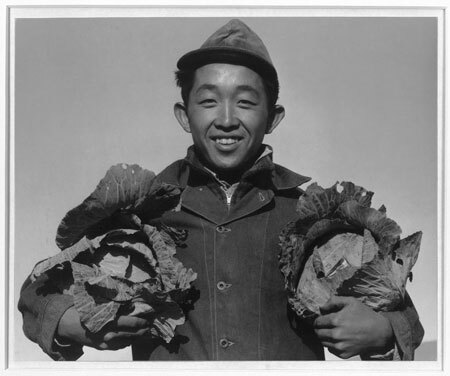 Richard Kobayashi, farmer with cabbages, Manzanar Relocation Center, California. Photograph by Ansel Adams, courtesy U.S. Library of Congress. Adams went to Manzanar to contribute to the war effort and demonstrate the "loyalty" of these Japanese American citizens. He explained, "The purpose of my work was to show how these people, suffering under a great injustice, and loss of property, businesses and professions, had overcome the sense of defeat and despair by building for themselves a vital community in an arid (but magnificent) environment." He was forbidden to depict the guard towers or barbed wire, and his images tended to depict the adaptability of the internees to a harsh desert environment. In his book, Born Free and Equal, Adams argued for the loyalty of the internees even under duress. Adams's images and text suggest that the internees took a certain pleasure in their internment, with all the contributing-to-the-war-effort rhetoric that was prevalent at the time. Adams was not opposed to relocation and called it simply "a detour on the road to American citizenship" for the Japanese. As an apologist for the evacuations, Adams used his photos to demonstrate the success of the relocation program. He wanted to show Americans outside the camp that Manzanar internees were in fact industrious citizens who could make valuable contributions to any American community. Ironically, Adams's book was initially unpopular because it was seen as pro-Japanese. It created a picture of a productive, even utopian, relocation center that had been created — according to Adams — primarily by the internees. In reality, conditions at Manzanar were far from ideal. Despite their elaborate gardens and farms, the internees complained of constant, severe dust storms. Cultural anthropologist Larry Van Horn wrote: "An everyday irritant to Japanese Americans interned at Manzanar was the constant wind that seemed to deposit dust and sand on everything. This was so despite the DWP making water available for crop irrigation … . Owens Lake dried up; its dust pollutes the air." Indeed, the constant drive to build more gardens and bring more water in was in part an effort to fight the dust problem. One internee commented, "The main thing you remembered was the dust, always the dust." In And Justice For All, Tom Watanabe remembers the dust storm as an almost nightly occurrence: "You had the dust storm come through. You get half an inch of dust. You either get in bed and cover yourself with a sheet or just stand out there and suffer. You couldn't even see three feet in from of you, and then by the time the dust was settled, you had at least a half inch of dust right on your sheet when you got under it. Used to come from underneath the floor." The floorboards at Manzanar were built out of green wood, which shrank when it dried. Thus, residents would have their homes and beds constantly covered with dust. Helen Brill explained: "Every afternoon there was a terrible dust storm, and so then you had to hose out your barracks." Kacy Lynn Guill, a ranger at Manzanar, said the internees used discarded tin can lids to try to seal out the wind. "They said they could tell where they had laid down at night because there would be an outline of their body in the dust when they woke up," she said. Even after the floorboards were covered with tarp, the dust problem continued. The "fine white dust" often described by internees is consistent with descriptions of dust from Owens Lake. Owens Lake dust is significantly different from regular dust due to its white color and fine consistency. It is often mistakenly referred to as a "mist" or "fog." Scientists have described this dust as a "pervasive, unusually-fine-grained, alkaline dust that infiltrates the smallest cracks and contaminates residences." Again and again, internees described their frustration at the effort to keep the dust out of their homes. Others tried to take a more lighthearted approach to having to live with the dust. In her memoir, Jeanne Wakatsuki Houston describes laughing at the sight of her clothes and her bed: "Now our cubicle looked as if a great laundry bag had exploded and then been sprayed with fine dust. A skin of sand covered the floor. I looked over Mam's shoulder at Kiyo … . His eyebrows were gray, and he was starting to giggle. He was looking at me, at my gray eyebrows and coated hair, and pretty soon we were both giggling … . Woody's voice just then came at us through the wall. He was rapping on the planks as if testing to see if they were hollow. 'Hey!' he yelled. 'You guys fall into the same flour barrel as us?'" 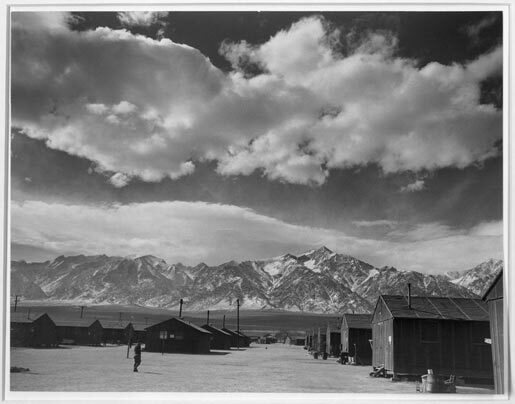 the sands at Manzanar became part of the culture and understanding of the community itself. In the art of the internees, the dust came to represent the burial of the culture or the stripping away of identity. Painting depict internees huddled together against the dust, or having clothes and umbrellas blown away by the dust. Today, the Great Basin APCD has warned that areas north of Lone Pine, including Manzanar, are still "significantly impacted by Owens Lake dust." The Great Basin APCD is particularly concerned about Manzanar because of "the health hazards posed to an estimated 250,000 to 350,000 visitors that are expected to annually visit the Manzanar National Historic Site, 15 miles north of Owens Lake." Most of these visitors are older and particularly prone to respiratory illnesses. Dust levels in nearby Lone Pine have been shown to be over three times higher than the dust levels considered hazardous by the Clean Air Act. Today, the Manzanar National Historic Committee is seeking volunteers to do research on the deaths of over 135 people at Manzanar in an attempt to confirm rumors of a disproportionate number of respiratory-related deaths. The total number of dust-related deaths may never be known, as the dust is known to be carcinogenic. Finally, there is the future impact on those relatives and survivors who continue to visit the camp. Unknowingly, these visitors may be receiving toxic doses of heavy metals during their stay. Katharine Krater said that there was a "conspiracy of silence" around the subject of Manzanar in Owens Valley. "People just preferred not to talk about it," she said. In Voices Long Silent, Arthur A. Hanser and Betty E. Mitson made the same claim about the Japanese Americans interned at Manzanar. The internees were reluctant to talk about their experiences there, through for different reasons; the memories were painful, or they felt embarrassed, or they wanted to put their lives as internees behind them. Many lived in disbelieve that they could have been treated that way, or feared that it could happen again. Manzanar was closed in 1945. Today, you can see inscriptions in Japanese characters in the concrete of the empty reservoir and settling basin. Three inscriptions, which have been translated, read: "the army of the emperor occupied territory, 2/17/43, to Manzanar"; "banzai, the Great Japanese Empire, Manzanar Black Drago Group headquarters"; and "beat Great Britain and the USA." During the majority of the war, these inscriptions were safely concealed by water from the Los Angeles Aqueduct. But after the war, Manzanar was bulldozed and the reservoirs drained; these hidden notes surfaced. The buildings of Manzanar also still exist, but they have morphed into different histories and meanings. They can be found throughout the Owens Valley, Ridgecrest, and even Lost Angeles. More than 500 buildings were sold at the close of the war, many to returning veterans who were given a special price of $333.13 per barracks. Some barracks were sold whole and carted away to be turned into homes elsewhere and some were turned into scrap lumber and rebuilt. Architect Erwood P. Elden drew up four floor plans for houses that could be built entirely from materials salvaged from a barracks. The removal of buildings, however, did not go uncontested. The project director of Manzanar, Ralph Merritt, wrote to the Department of Water and Power to request "a five-year lease on certain acreage and facilities within the present fenced area of the Manzanar Center." Merritt claimed that he simply had grown attached to the place and after living there for 12 years did not want to leave. But Merritt, who had previously been a rancher living near Big Pine, seemed to want land for more than personal property. Merritt, who had once been the successful owner of Sun Maid Raisins, had relatives in eastern California and was close friends with the descendant of John Shepherd, who had homesteaded the land at Manzanar since 1864. Merritt had also speculated in silver and mining ventures in Death Valley, so he was a well-established and wealthy member of the community by World War II. In his letter to the Department of Water and Power, he admitted that his motivations where not merely personal, claiming that Owens Valley was "in urgent need of housing facilities" for "schoolteachers in nearby towns" as well as "veterans and other residents." Merritt argued that "no housing now available should be destroyed or removed." Instead, Merritt proposed allowing the leaseholder to operate 26 buildings, including apartments and single rooms, the administration building, the mess hall, and one warehouse. He also wanted "all present furnishings," along with water, sewage, and electrical lines. The water, he said, would be used for "lawns and dust control" and should be supplied without added charge. In addition, Merritt wanted 20 acres, to be "used for agriculture." Finally, he wanted the hospital buildings, children's village, or Blocks 29 and 34 together with water, sewage, and electrical lines. He claimed that he would use this property as "a tourist and recreational center." He wrote, "Because of the gardens now in this area and the adaptability of the buildings little new capital would be required for a tourist center of about 50 units." It appeared, in fact, that he wanted to build a new agricultural community in Owens Valley, much like the old town of Manzanar. Ignored by the Department of Water and Power, Merritt wrote again on May 9, though there were already negotiations between the FPHA and Inyo County Housing Commission for removal of the buildings. He reminded them of his request for a lease, arguing that his son, Peter, had worked at Yosemite National Park and could be employed at the new Manzanar tourist site, since he had "valuable experience in activities of that nature." He also desired to lease a small area in the vicinity of the hospital to establish "a semi-recreational and tourist facility, taking advantage of the approximately $5,000 worth of roses and other shrubs that the Japanese had left there." Again, Merritt was ignored by the Department of water and Power, and demolition of the area proceeded. Merritt, who had initially enticed the U.S. Government to place the interment camp at Manzanar before the war, did not appear to want to give up his re-created paradise. Interestingly, when Ansel Adams, who was a personal friend of Ralph Merritt, came to visit Manzanar, he agreed not to photograph the more prison-like aspects of Manzanar at Merritt's request. While most historians believe that this was a reflection of Merritt and Adams's support of the relocation policy, it could be that Merritt was trying to promote the idea of an ideal farming community in the desert — a historical Manzanar. Today, photographer Andrew Freeman has tried to discover and photograph buildings that were once part of Manzanar. He has found that it is difficult to prove which buildings were from Manzanar. Many people, he said, do not want anyone to know that they own a Manzanar building. The National Park Service, in preparation for opening the Manzanar interpretive site, sent out flyers in 2002 asking people to call them if they owned a Manzanar building. They were frustrated with their lack of response. Andrew Freeman said, "They were afraid of losing their homes." The Park Service did reclaim a double-wide building that had been abandoned at the Bishop airport. The service moved it back to Manzanar, where it sits on concrete blocks surrounded by orange pylons. The building is believed to be either the mess hall or the hospital, but since its removal from the airport, controversy has emerged as to whether it ever was at Manzanar, since the records for the building were lost. Since its arrival at Manzanar, a swarm of bees has set up habitation in the building and the park officials are trying to figure out how to exterminate them. Visitors are warned not to go near the building. Mess hall today. Photo by Karen Piper. Used with permission. Denial and controversy surrounding the meaning and history of Manzanar have continued since its establishment. It is a perpetually indecipherable area. There has been a debate, for instance, about the existence and purpose of the guard towers. Were there eight guard towers or only one? Were the guard towers meant to guard internees from outsiders or monitor them as prisoners? Ross Hopkins, Manzanar superintendent, noted: "The Japanese were told they were put here for their own protection, but they all say that the guns were pointed inwards." This debate about Manzanar culminated in a controversy surrounding the wording of a plaque that was placed at the site in 1973. The plaque reads: "In the early part of World War II, 110,000 persons of Japanese ancestry were interned in relocation centers by Executive Order No. 9066, issued on February 19, 1942. Manzanar, the first of ten such concentration camps, was bounded by barbed wire and guard towers, confining 10,000 persons, the majority being American citizens. May the injustices and humiliation suffered here as a result of hysteria, racism, and economic exploitation never emerge again." In Bishop, a petition protesting the establishment of the park circulated. "We do not have any bitterness or animosity toward any Japanese who were loyal to the U.S.," the petition started. Then it went on to claim that camps such as Manzanar were necessary because the Japanese were "under suspicion" and "needed protection." The petition was signed by more than 100 people. "This has been a very contentious park," Ross Hopkins said. "People threatened to blow up the building. I had to unlist my phone number." Many people in Owens Valley want to forget that Manzanar ever existed or to deny that it was a bad thing. The polarized images of utopian farming commune or concentration camp continue to swing back and forth like a historical pendulum. As late as 2003, there was only one Paiute who took it upon himself to teach people about Japanese internment on lands that once belonged to his tribe. Interestingly, the Lone Pine Indian reservation tribal office was also housed in a Manzanar building. But many Paiutes did not want to see Manzanar developed as a historical monument, since they feared erasure of their own history of suffering at Manzanar. A letter from five Owens Valley tribal elders to the Inyo Country Board of Supervisors in 1979 claimed that "to develop an elaborate Japanese-American project means the desecration of the spiritual cultural heritage of the aborigines." Richard Stewart, Manzanar's tour guide, became interested in Japanese history after studying Japanese pottery. Stewart led people on a tour that covered the history of the Paiute residents as well as that of the Department of Water and Power and the Japanese Americans. Stewart's tours were funded by a $3,500 grant from the Eastern California Museum, because the National Park Service did not grant funding for this purpose. Sue Kunitomi Embrey, who lived in the camp, was thankful: "At least somebody will be there and do something so people won't come there and find nothing there except an empty lot and rusted cans." At the time, Congress was planning to spend $310,000 to build a fence to keep out cattle and vandals. Ross Hopkins commented, "I think it's pretty pathetic … but the tours are a real tribute to the Eastern California Museum. Private citizens are taking their own time and energy to do something that really the federal government should be doing." Stewart survived temperatures up to 110 F in the summertime, with no air conditioning or even portable toilets. He gave tours five days a week during the summer and on weekends during the school year, when he taught elementary school. The guard booth where he spent his days when he was not taking people on tour was only 13 by 14 feet and had a dirt floor. In September 2000, I visited Manzanar to see how developments were progressing. There was no one at the guard gate. Richard Stewart had apparently left for the winter, as the guardhouse was boarded up. The guardhouse was full of cobwebs and it looked as if it had been abandoned for years, except for the shiny new padlock on one window. There was a grid of dirt roads, however, and a manual for a self-guided driving tour. Sticking out of the ground were signs that said "Auditorium" or "Barracks" or "Hospital." I drove to the orchards, where a few straggling trees still remained. There were apples hanging on one tree, and bear droppings full of fruit surrounded the tree. I tasted one apple, which was very bitter, like a cross between a crab apple and a pear. Two cars drove quickly through Manzanar, not stopping. A coyote loped through the abandoned gardens, which were only empty concrete-lined pools and dried sage and tamarisk. Pool in pleasure park, Manzanar Relocation Center, California, 1943. Photograph by Ansel Adams, courtesy U.S. Library of Congress. Pleasure Park today. Photo by Mary Piper. Used with permission. It was difficult to imagine the thriving gardens and the orchards and the amount of food that was produced at Manzanar. 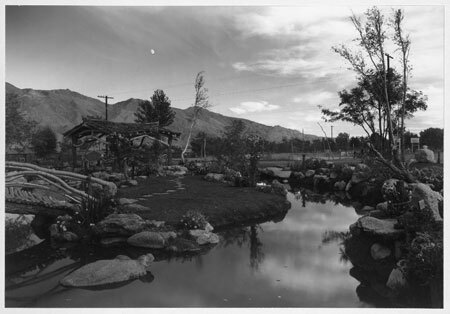 The Department of Water and Power did not want to return water to Manzanar for restoration purposes, so a few faded photographs were all that remained of the gardens. Pleasure Park still had the rocks that were carried to the gardens by the internees, but the grass was gone and the trees were struggling. The bridge over the pool crossed only dirt. For those internees who were still living there was only the dust to return their memories to them. 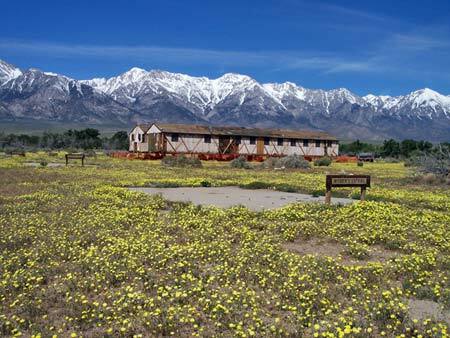 In April 2004, I returned for the opening of the Manzanar Visitors Center. More than 1000 people were there, including Japanese Americans who had been interned at the camp. It was fascinating to see the transformation, which, from the outside, consisted mainly of a large parking lot for buses. The inside of the auditorium, however, had been transformed, filled with memorabilia, multimedia presentations, and a wall covered by names of internees. It was, in fact, almost disconcerting to walk into the exhibit and feel the cool air and see the built-to-size guard tower and videos running on every wall. I must confess I felt more comfortable outside, in a landscape that was familiar. Outside, besides the Disneyland-sized parking lot, the only thing that appeared different was that the number of portable toilets had increased from one to three. Also, there was that intriguing, neglected building on pylons that was full of bees. This is the desert I know, I thought. It is hard to say which version is more familiar to the residents of Manzanar or which is most appreciated. At the entrance to Manzanar, there is a sign hanging that says "Manzanar War Relocation Center." It looks like the original one, but I know it is not. The original sign was stolen and never recovered, even though it turned up on eBay in the early 1990s. To me, this stolen sign represents all that is unattainable about Manzanar. Once, Manzanar was forgotten, buried, covered over with dirt — as if this could make us forget the crime itself. Today, it is replicated and reconstructed in order to recreate at least the sensation that it once happened. Leaving the visitors center behind, I was relieved to see the same rotten fruit beneath the same old apple trees. At the cemetery, the same unmarked graves attest to the life that once thrived at Manzanar. This cemetery is marked by a white concrete obelisk built by the internees in 1943. It is still the place most remembered by those who return to visit Manzanar. The rope fence around the obelisk is covered in origami artwork, and the ground is covered in Japanese yen, broken plates, remnants of brick and concrete, stones wrapped in Japanese newspaper, dried flowers, and other memorabilia of a life that once was. The Japanese writing on the obelisk reads, "Monument to console the souls of the dead." 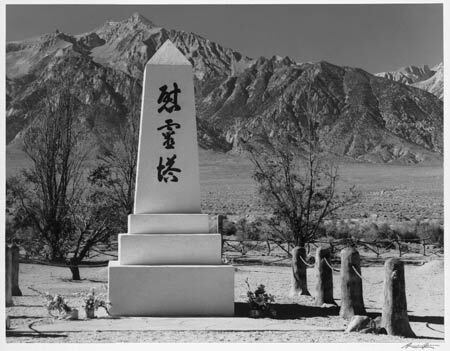 Monument in cemetery, Manzanar Relocation Center, California. Photograph by Ansel Adams, courtesy U.S. Library of Congress. Sadly, on the other side of the park, an Owens Valley resident bragged that he had driven to the park just to urinate on the new sign at Manzanar. When volunteers were sought from the Independence-based American Legion to post a color guard at the opening of the museum, no one volunteered. Legion post commander Carl King said, "So much has been said about [Manzanar]. You don't really know what the whole truth is." Such is the embarrassing legacy of Manzanar, which to this day is covered in the unhealthy dust of Owens Lake. This is the element that unites all Owens Valley visitors, past and present. Editor's note: Visit the Ansel Adams collection at http://memory.loc.gov/ammem/collections/anseladams/index.html. 1. Arthur A. Hansen and Betty E. Mitson, eds., Voices Long Silent, Fullerton Oral History Program (Fullerton: California State University, 1974), p. 62. 2. Jessie A. Garrett and Ronald C. Larson, Camp and Community: Manzanar and the Owens Valley, Fullerton Oral History Program (Fullerton, CA: California State University, 1977), p. 19. 3. Quoted in Diana Meyers Bahr, Viola Martinez: California Paiute (Norman: University of Oklahoma Press, 2003), p. 101. 4. Quoted in ibid., p. 103. 5. Quoted in ibid., p. 99. 7. Jeanne Wakatsuki Houston and James D. Houston, Farewell to Manzanar (New York: Bantam Books, 1973), p. 99. 8. Garrett and Larson, p. 39. 10. Garrett and Larson, p. 98. 12. Ibid., p. 38, 66. 22. Hall Daily, "David-Goliath Fight Continues Over Water from Owens Valley," Bakersfield Californian, October 26, 1980. 23. Robert A. Sauder, The Lost Frontier: Water Diversion in the Growth and Destruction of the Owens Valley Agriculture (Tucson: University of Arizona Press, 1994), pp. 96-97. 24. "Ansel Adams' Manzanar War Relocation Center Photographs," Special Collections in the Library of Congress. 25. Ansel Adams, Born Free and Equal: Photographs of the Loyal Japanese Americans at Manzanar Relocation Center (New York: U.S. Camera, 1944), p. 35. 26. Larry Van Horn, "American Indian Links to Manzanar," Cultural Resource Management, No. 5 (2001), pp. 16-18. 27. Armor and Wright, xiii. 28. John Tateishi, And Justice for All: An Oral History of the Japanese American Detention Camps (New York: Random House), 1984, p. 95. 29. Interview with Helen Brill, "Voice from the Second World War Collection," Thomas J. Dodd Research Center, University of Connecticut. 31. These two quotes are from Arthur A. Hansen, ed., Japanese American World War II Evacuation Oral History Project (Westport, CT: Meckler Publishing, 1991), pp. 236, 206. 32. Dorothy Swaine Thomas and Richard S. Nishimoto, The Spoilage (Berkeley and Los Angeles: University of California Press, 1946), pp. 3, 69. 33. Ellen Levine, A Fence Away from Freedom: Japanese Americans and World War II (New York: G. P. Putnam's Sons, 1995), p. 51. 34. Aly Colon, "Bainbridge Residents Recall Confinement," Seattle Times, May 7, 1996. 35. Houston and Houston, p. 88. 36. M. C. Reheis, "Dust Deposition Downwind of Owens (Dry) Lake, 1991-1994: Preliminary Findings," Journal of Geophysical Research, v. 102 (1997), pp. 25-26. 37. Houston and Houston, p. 23-24. 38. Eleanor Roosevelt, "To Undo a Mistake is Always Harder than to Not Create One Originally," Franklin D. Roosevelt Library (Hyde Park, New York). This essay was published in a revised form on October 10, 1943, in Collier's Magazine. 39. Appendix 25, "The Silverman Report: Project Director's Report," Final Report, Manzanar, Vol. I, pp. A 174-75, RG 210, Entry 4b, Box 71, File, "Manzanar Final Reports." 40. Joan Brooks, Desert Padre: The Life and Writings of Father John J. Crowley, 1891-1940 (Desert Hot Springs, CA: Mesquite Press, 1997), p. 45. 41. Great Basin Air Pollution Control District, Owens Valley PM-10 Planning Area Demonstration of Attainment State Implementation Plan, Draft, May 1997, p. 4-1. 43. Quoted in Garrett and Larson, p. 65. 44. Rabin [sic]. Merritt to Samuel B. Morris, General Manager and Chief Engineer, Department of Water and Power, Los Angeles, March 26, 1946, Correspondence—Removal of Buildings, November 1945-April 1946, Manzanar Relocation Center, Administrative and Executive Files, Water Executive Office, LADWP Historical Records. 48. Burton S. Grant, Assistant Chief Engineer of Water Works to Samuel B. Morris and Laurence E. Goit, May 9, 1946, Correspondence—Removal of Buildings, May-June 1946, Manzanar Relocation Center, Administrative and Executive File, Water Executive Office, LADWP Historical Records. 49. Presentation by Andrew Freeman for the Center of Land Use Interpretation, Owens Valley Bus Tour, April 24, 2004. 50. Garrett and Larson, p. 91. 53. Robert Ito, "Concentration Camp or Summer Camp? A New Generation of Revisionists Tries to Put a Happy Face on the Japanese American Relocation Camps," MoJo News, September 15, 1998. 54. William Booth, "A Lonely Patch of History: Japanese-Americans Were Forced to Live Here, They Don't Want It to Be Forgotten," Washington Post, April 15, 1997. 55. Paul Rogers, "W.W. II Internment Camp Survivors Upset by Lack of Progress on Memorial," San Jose Mercury News, March 10, 1997. 56. Quoted in Rebecca Fish Ewan, A Land Between: Owens Valley, California (Baltimore: The Johns Hopkins University Press, 2000), p. 165. 57. "After Years of Effort, First Tours Will Be Given at Manzanar Site," Boston Globe, July 27, 1997. 59. Kimberly Edds, "New Museum Revives Painful Memories for Internees," Washington Post, April 26, 2004. From Left in the Dust by Karen Piper. Copyright © 2006 by the author and reprinted by permission of Palgrave Macmillan. Cover image: Manzanar street scene, clouds, Manzanar Relocation Center, California. Photograph by Ansel Adams, courtesy U.S. Library of Congress. Karen Piper is an associate professor, Department of English, University of Missouri-Columbia and author of Cartographic Fictions: Maps, Race, and Identity. She lives in Columbia, Missouri. Buy Karen Piper's books through Amazon at the LOST Store.